Welcome to Echo Ridge, New York where romance finds its way into the hearts and lives of the people who walk the streets of the close-knit community. In these five novellas, readers will experience the power a book has to change a life, make dreams come true, and bring two hearts together as the characters work to fill the classic section of the library. Filled with charm, wit, secrets, and hope, each story is a sweet romance with a promise to keep you turning pages into the night. 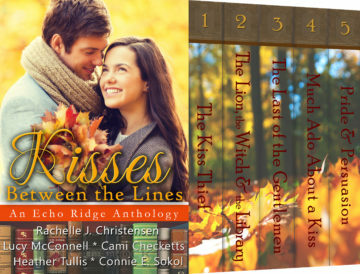 We hope you enjoy this book and the kisses between the lines. The Kiss Thief by Rachelle J. Christensen As the head librarian of the Echo Ridge Library, Britta Klein thrives on order and categorization. Unfortunately, the old church-turned-library is in desperate need of a renovation. The Harvest Hurrah fundraiser seems to be the answer, but plans keep going awry. With help from Milo Geissler, accomplished musician, piano tuner, and kiss thief, each catastrophe is narrowly avoided. When Milo goes to great lengths to help Britta find a key classic book, she begins to wonder if there is more to life than books and order. Can she allow this man who speaks the language of music to tune her heart to a new song? The Lion, The Witch, & The Library by Lucy McConnell Jennifer Solomon’s birthday wish is for the one thing she’s been too shy to go after: Kirke Staples, Echo Ridge’s resident playwright, an avid mountain biker, and her best friend. Friend, as in don’t kiss, don’t covet, and don’t under any circumstances fall in love with the man. But it’s too late–she’s already fallen in love. Hoping for a birthday kiss that will change everything, she arranges an “accidental” meeting with the handsomest man on the library board. Her carefully laid plans are thrown off track when the beautiful Bay Barington sweeps into town and casts a spell over Kirke. In her efforts to win Kirke’s heart, Jennifer is forced to take a look at her inner self and decide what type of woman she wants to be, a lion or witch. The Last of the Gentlemen by Cami Checketts Despite the hardships she’s faced, Emma Turner, is determined to make a good life for her three children. Working nights and struggling through life doesn’t leave much time for romance, which is just fine as far as Emma is concerned. But when her son’s good-looking lacrosse coach takes an interest in her children, Emma has to fight off the smolder in her stomach and banish her daydreams. This school-girl crush needs to end before she embarrasses her son and herself. If only she could tell that to her heart. Much Ado About a Kiss by Heather Tullis Fay’s life is just fine, thank you. Running the café she’d practically been raised in: Check. Her artwork in a gallery: Check. Volunteering on the library board: Check. The one thing she doesn’t need right now is a guy in her life–especially her brother’s irritating best friend from high school, so when the two men announce that they are moving home to start a ski and mountain bike shop in town, she isn’t pleased. If only she could completely forget that one kiss she and Austin shared in high school. Why does he have to upset her just-fine world? Not this time. Not if she can help it. But can she? Pride & Persuasion by Connie E. Sokol Lindy Marchant has left heartbreak and downtown L.A. to help her cousin kickstart an antique shop in sleepy Echo Ridge. That is, until she’s roped into the library fundraiser to become an assistant for Armand D. Beaumont, the French bestselling detective writer. The two have met before, and Lindy hasn’t forgotten the disastrous outcome. Now Armand’s celebrity quirks threaten to upset her life yet again. Or, is there a deeper reason for his unpredictable choices? While Armand inadvertently assists Lindy with the shop, she uncovers his painful truth and an inconvenient growing attraction. Can Armand let go of his pride and face his fears? And can Lindy be persuaded to take the untried road, even together?